Bryan Survives ‘Juan of the Dead’ and Lives To Tell About It!!! By the end of Alejandro Brugués’ foreign film Juan of the Dead, you’ll be chanting the film’s title over and over. For the past ten years or so, the zombie genre has become a household brand and form of entertainment. Each director of a new zombie film tries to find novel ways to portray the flesh-eating undead. There are the comedic horror zombies of Shaun of the Dead and the scary-as-hell, running zombies in the recent Dawn of the Dead. I’ve even seen African zombies, stripper zombies, and nazi zombies. 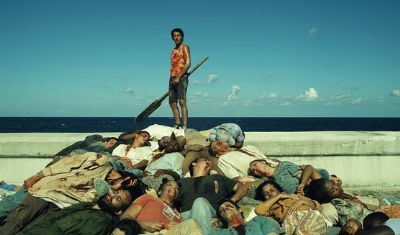 With Juan of the Dead, we get a black- humor zombie film with a caricatured backdrop of modern-day political Cuba. Juan of the Dead takes it cue from Edgar Wright’s Shaun of the Dead in that it’s heavy on the comedy with just a sprinkling of horror. The film also pays homage to almost every zombie film I’ve ever seen, complete with a zombie being eaten by a shark. The story starts out with Juan (Alexis Díaz de Villegas) and his best friend, Lazaro (Jorge Molina), who are middle-aged, jobless, lay-abouts that spend their days fishing in a boat made out of only a couple of scrap pieces of wood, drinking heavily, and peeping on women through open windows. They’re not your model citizens. Suddenly, Cuba is instantly swarmed with blood-thirsty zombies, and that’s when Juan has his first good idea in his life. Juan and Lazaro start a business. If your loved ones turn into a zombie, and you can’t stomach the thought of killing them, Juan and Lazaro will do the dirty work for you–but only for a hefty price. The business is called ‘Juan of the Dead’, and their motto is, “We Kill Your Relatives.” Because there was so much demand for their services, they have to hire help. They get a motley crew consisting of a 400- pound muscular guy who faints at the sight of blood, a transvestite who is quick with a slingshot, Lazaro’s son who is obsessed with California, and Juan’s daughter, who becomes a ninja overnight. From here, they go from job to job trying to collect money and stay alive. 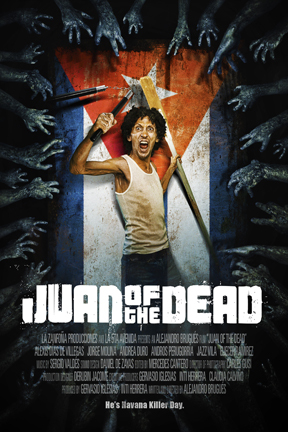 Juan of the Dead doesn’t change the game as far as zombie films go, but it is a charming and funny horror film. Alejandro Brugués’s hand-held camera work is raw and rocky, making you feel like you are actually in the midst of a zombie outbreak. It adds to the hysteria of it all. The zombie kills are a lot of fun. They come off as more playful rather than scary and gross. There is even a scene where 500 zombies are decapitated all at once. The film is also a satire of life in modern-day Cuba. 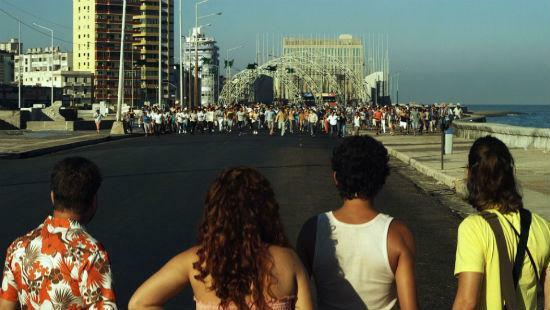 Zombies are not referred to as zombies, but instead are called ‘dissidents’, reflecting the Cubans’ belief that these flesh-eating ghouls were sent from the American Government to destroy Cuba. The socio-political zombie commentary is not a novel approach in zombie films since George Romero has been doing it for 40 years. But, this is the first time I’ve seen it done this way in satirical form. Juan of the Dead is an entertaining movie-going experience, particularly if you love the genre. Although zombie movie fans will likely have seen this same story before, there is a treasure trove of laughs, and all of the characters are very likable (even Lazaro with his psychotic desire to use his giant harpoon and machetes even when no zombies are in sight). I know I will see Juan of the Dead at least 250 more times before I die, and I can’t wait to show my friends this film. Film Review: ‘World War Z’!!! This entry was posted on Sunday, May 6th, 2012 at 5:04 pm	and is filed under Film, News. You can follow any responses to this entry through the RSS 2.0 feed. You can skip to the end and leave a response. Pinging is currently not allowed.